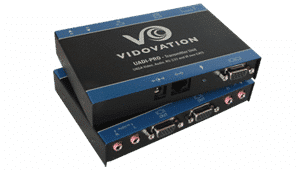 VidOvation’s non-blocking digital video matrix switch provides an easy and dynamic approach to creating up to 16 computer stations, each with the ability of accessing any one of the CPUs or displays instantly either directly or remotely, using RS-232 commands, IR, USB or TCP/IP. Our DVI router is controlled by Windows®-based software that is easy to understand and simple to use – a cornerstone of all VidOvation products. 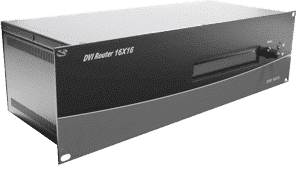 The VidOvation DVI Router 16×16 provides single-link, DVI-D operation at the maximum TMDS rate of 2 x 1.65 Gbps at resolutions up to 1920 x 1200. 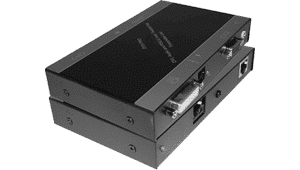 The DVI-D signals can be transmitted through 30 feet of copper at the maximum TMDS rate on both the input and output sides of the switch. Increases productivity by providing access to up to 16 computers from 16 workstations.